We are energised as some of our favourite handmade Irish Gifts arrive back into stock. We have listed these unique gifts below and we hope you love them as much as we do, all handmade in Ireland. In a great price range these Irish Gifts make lovely present ideas for lots of different special occasions for your family and friends in Ireland and all around the world. This Irish bracelet is a full set of Rosary beads with a golden Celtic cross and St. Patrick holy medal. This is a coil bracelet which fits easily over any size hand and wraps around your wrist. 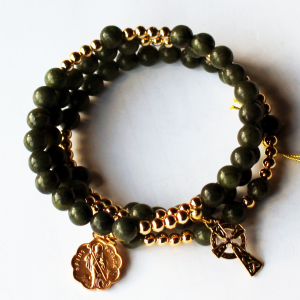 The Rosary Beads Bracelet also has a golden cross and a St. Patrick holy medal, with golden beads between the decades. At this time of year this Irish gift is ideal for Confirmation Gifts, St. Patrick’s Day Gifts and Mother’s Day Gifts. Customers have also purchased this set of Rosary Beads for Birthday Gifts, Christmas Gifts and Sympathy Gifts. A traditional gift of friendship, Connemara Marble is Ireland’s national gemstone, over 900 million years old. This unique Connemara Marble is quarried by hand at Lissoughter, Recess, Co. Galway and crafted and polished by hand in Dublin. At this time of year this Irish gift is ideal for St. Patrick’s Day Gifts and Mother’s Day Gifts. Customers have also purchased this Soap Gift Box for Birthday Gifts, Christmas Gifts, Kriss Kindle Gifts, Thank You Gifts and Get Well Gifts. 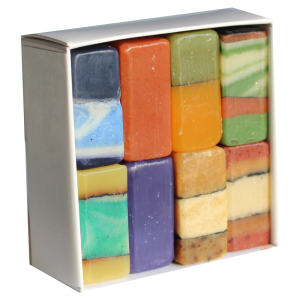 Beautiful soaps, handmade using traditional techniques & 100% natural ingredients. C elebrate Ireland’s rich folklore and history with these beautiful map of Ireland slate coasters with beautiful colouring. These handcrafted natural slate coasters are coated to be water resistant and have felt pads underneath to protect surfaces. Amazing 500 million year old natural hand-cut slate. 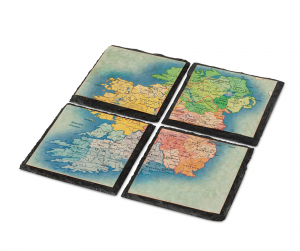 Map of Ireland Coasters will go down a treat as St. Patrick’s Day Gifts, customers have also bought these coasters as Mother’s Day Gifts, Father’s Day Gifts, Birthday Gifts, Christmas Gifts, Easter Gifts, New Home Gifts and Boy Voyage Gifts.